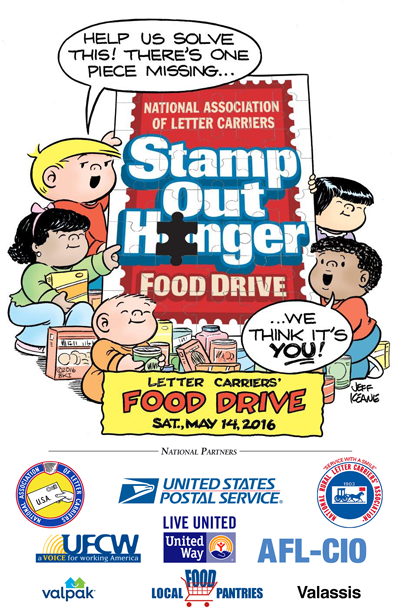 Next Saturday, May 14, is the 24th annual Letter Carriers’ “Stamp Out Hunger” campaign. Last year’s food drive brought in approximately 71 million pounds of non-perishable food for hungry individuals and families. Since starting the Stamp Out Hunger campaign 24 years ago, more than 1.4 billion pounds of food have been collected. Next week letter carriers will deliver plastic bags to local mailboxes. Please fill up your bag with non-perishable food and leave it by your mailbox on Saturday, May 14. Follow the Stamp Out Hunger food collection campaign on Facebook. New this year is a Donate Fresh Food Online campaign for the month of May where donors can help provide fresh food to hungry families in San Francisco and New York City. Click here to learn more. Not sure what items are best to donate? We can help. Here is a list of the Kent Food Bank’s top 25 most needed items. In addition, keep in mind that it is not always possible to heat food up, so consider items that don’t require additional cooking or preparation (e.g., tuna, peanut butter, snack bars, etc. ).